Bob Landers, and prior to that Nick Dales is a canoe livery on the Delaware River near Ten Mile River Scout Camps. This is a private company providing canoe rentals to groups and individuals in addition to many Scout groups. Nick Dale as some of you may know was active in GNYC and Brooklyn Council and worked at the Brooklyn Camps on Rock Lake prior to starting what is now Landers. 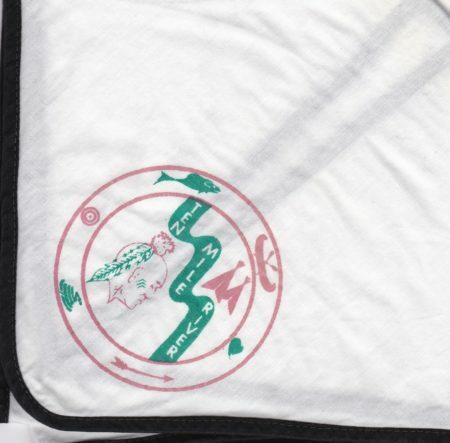 As their main lodge was located on one of the branches of the Ten Mile River, their proximity to the camp and their Scouting roots, over the years, they have issued a number of patches and neckerchiefs. Their memorabilia never referred to the Scout Camp or used the Indian cliffs logo, but always contained the words Ten Mile River in the design. I recently acquired the neckerchief below, which does not contain their typical design but does have their Indian in profile.